Recently a member of the forum asked about extracting statistics for surnames of ancestors of matches. This is fairly simple to do. The following is a multi-step process because doing it in one step crashed SQLite Studio on my computer, which is Windows 10, 64-bit, with 12 GB memory and 1 TB disk. The surname metaphone is included because spelling variations are important to one of my puzzles and might be important to you. Also, the number of ancestors with a surname and the number of matches with the surname can be two very different numbers. The idea is to bring the statistics into Excel or another spreadsheet program to work with the data. First let's look at the output in Excel. As an example, I have a woman named Mary Williams in my ancestry. Williams is a fairly common name, unfortunately for me. 1164 of my matches have an ancestor named Williams and there are 2793 of those ancestors. Another of my puzzles is a man named Vossler. This is a name that is spelled in various ways, so the metaphone is important. Filtering the metaphone for FSLR results in more information than trying to guess all the spelling variations. Working in a copy of your database, here are the steps and queries. Create a work table and insert the surname data into it. Put in your exact test name where the query says Your Test Name. Do not delete the work table until you have exported the data. where name= "Your Test Name"
After the query has run, double-click on the table named ancestors_count on the left side of the screen to open the table. Click on the data tab above the query. When the data appears, click on the exploding arrows, which is the export icon. Choose to export ONLY the table data, click Next. Select the export format, which works nicely as CSV. Use the disk icon to browse for where you want the file and to enter the file name. Choose to export the column names in the first row and choose the comma as the column separator. Click Finish. It takes only a couple of seconds. After verifying the output file is what you want, you can delete the work table and disconnect from the work database. Or you can just disconnect from and delete the work database. If you have multiple tests that you want to run through this process, drop the work table and start over for each test. You want to analyze your shared matches because that's going to help with your brick walls. Unfortunately, the AncestryDNAHelper does not capture shared matches into the database, as of this writing in May, 2018. I've received a number of inquiries about how to analyze the data. Without the data, there is nothing I can provide for analysis. If you want to capture and review shared matches, you will want to check out DNAGedcom. I have not yet worked with that database, so cannot at this time answer any questions about it. There is a group at Facebook where questions can be asked. A few months ago Roger, one of the mailing list members, shared a number of his SQLite queries with me to share with you. They range from simple to more complex. My favorite is the first, with the rest following. You'll have to read the comments to see what each query does. These queries will not change your database, so feel free to try them out. This handy query creates a list that shows the number of common matches that each of my 11 tests has with each of the other 10. Here's the sample output with changed names to protect privacy. -- How many tests are in my database? -- How many total matches are in my database? -- How many total ancestors are in my database? -- How many matches does each of my tests have? 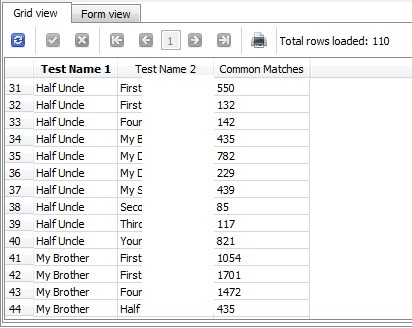 select a.id, a.name, count(*) as "Matches"
select a.name, b.range, count(*) as "Matches"
select a.name, b.range, confidence, count(*) as "Matches"
-- How many ancestors of matches does each of my tests have? select a.name, count(*) as "Ancestors of Matches"
There are also a few ancestor queries on one of the reference pages of this blog. See the page on running queries. I had the (mis? )fortune to inherit 100 years' worth of family photographs from my grandmother. That gift led me to related hobbies of researching and scrapbooking my family's history. My day job is wrangling data for local government. Comments are moderated. Simple theme. Powered by Blogger.